Analysts were right to say that the Republican takeover of Congress bodes well for the war machine: already we see the levers of power slowly shifting in reverse, eager to get back to salad days of post-9/11 wartime spending. But waiting in the wings, Hillary Clinton just may prove to be what the defense establishment has been waiting for, and more. Superior to all in money, name recognition, and influence, she is poised to compete aggressively for the Democratic nomination for president. She might just win the Oval Office. And by most measures she would be the most formidable hawk this country has seen in a generation. “It is clear that she is behind the use of force in anything that has gone on in this cabinet. She is a Democratic hawk and that is her track record. That’s the flag she’s planted,” said Gordon Adams, a national security budget expert who was an associate director in President Bill Clinton’s Office of Management and Budget. 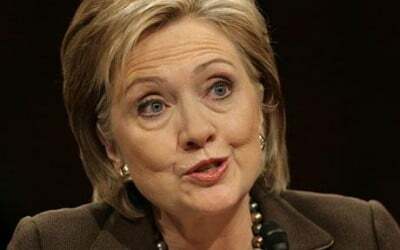 The former secretary of state, senator, and first lady appeared to fire the first salvo (at least in her national security arsenal) in her next presidential bid last summer, when she gave an interview to Jeffrey Goldberg mostly on the launch of her new autobiography, Hard Choices. In the much-ballyhooed Atlantic piece, Clinton defends Israel from charges of disproportionate attacks in Gaza, takes a hard line on Iran in the nuclear talks, and suggests President Obama could have avoided the rise of ISIS by listening to her proposals for arming the anti-Assad rebels in Syria last year. Not long after, Leon Panetta—who served as Bill Clinton’s chief of staff before he was Obama’s CIA director, then secretary of defense in 2011—released his own tell-all, Worthy Fights. While the book itself might be more nuanced in its criticism of Obama’s foreign policy choices, the promotional tour, which came at the height of the current Islamic State crisis and right before the midterm elections, had Panetta blaming Obama for not keeping 10,000 troops in Iraq, then, and not having “the will to fight” in Iraq and Syria, now. Maddow was describing Beacon Strategies—a firm launched by a collection of former Hillary Clintonistas, including longtime spokesman Phillipe Reines. When it opened shop in 2013, Defense News noted that it looked like these former aides were keeping their powder dry for another government run; in the meantime Beacon was “built on providing advice to companies, primarily defense contractors, focused on international defense business as well as cyber, although their first client was Bash’s former boss, Panetta.” Panetta has since joined the firm. If Hillary Inc.’s first order of business was to define her worldview away from her former boss, it also seemed to take on some of that old Clinton triangulation magic—anticipating the usual trope that Democrats are too squishy on defense. And it seemed to work, for now. Panetta’s attacks on Obama were so welcomed by the right wing that Karl Rove called him a “patriot” on Fox News. Hillary’s prevailing record in Washington is as ideological as it is political. In the purest sense she endeavors at what writer Peter Beinart refers to as muscular liberalism, in the vein of Presidents Truman and Kennedy. Her intellectual coterie includes elite purveyors of “humanitarian interventionism” like former Clinton Secretary of State Madeleine Albright and Anne Marie Slaughter. “America, at its best, is a problem-solving nation. And our continued commitment to renovating and defending the global order will determine whether we build a future of peace, progress and prosperity in which people everywhere have the opportunity to live up to their God-given potential,” she writes. Her bond with the former Nixon national security advisor, who she boasts, “checked in with me regularly” during her time as President Obama’s secretary of state, reflects the paradoxes inherent in both their tenures. She says they both share “a belief in the indispensability of continued leadership in service of a just and liberal order,” yet Kissinger is best known for expanding the war in Vietnam. In the interest of global order he pushed for continued air strikes on Laos and helped initiate a secret bombing campaign in Cambodia without congressional approval, ultimately strengthening the genocidal trajectory of the Khmer Rouge. Hillary may have been protesting the Vietnam War while Kissinger was escalating it, but she has long since seen force as a way to promote democratic goals, beginning with the NATO bombing of Serbia in 1994 (when, of course, it politically suited, as the late Christopher Hitchens pointed out in 2008). So when she became a New York senator in 2001, she chose to consult with the brass, including Gen. Jack Keane, who helped to draft the so-called surge in Iraq. She bonded with fellow Armed Services Committee member and chairman Sen. John McCain, who critics joke never saw a conflict he didn’t want to bomb his way out of. It was in the Senate that Clinton cemented her ties with the military, knowing full well that it helped her politically, too, given the lessons learned from her husband’s cool relationship with the Armed Forces more than a decade before. Her new friends did her no good in 2008, however, when she faced Barack Obama in the Democratic primary for president. The mood in the country was decidedly antiwar, and her vote for Iraq came back to haunt her. As secretary of state, however, she did little to distance Foggy Bottom from the subordinate role it had been playing to the Pentagon in world affairs after 9/11, said Adams. “She wanted to make sure she was never in a fight with [then-Defense Secretary] Bob Gates … One got the feeling from her she felt safest when the Secretary of State and the Secretary of Defense were at the hip,” he said. Clinton talks a lot about non-kinetic “soft power,” but Gordon said he “watched very closely as the State Department tried to align itself with the DoD,” under Clinton. “It concerned me because it leaned toward the hawkish side of her policy views,” said Adams, a firm believer that “there should be creative tension between both departments.” Meanwhile, the Clintonites who had come to inhabit the Obama administration, like Slaughter, began coalescing behind “responsibility to protect” or “R2P,” in hopes of saving the future of humanitarian intervention from the clutches of American war fatigue. On the surface it would appear that Clinton is expert at fusing her touchy-feely side with a seemingly instinctual desire to use the military to sustain and wield American “global leadership” to whatever ends. This approach can yield political paydirt, drawing in hawks from both sides of the spectrum. But to critics it smacks of “soft empire” and in that way, it’s no different than say, Robert Kagan’s neoconservatism—it’s all a matter of branding. Which brings us back to the politics, which has been in Hillary’s blood since she was a high school “Goldwater Girl.” She knows, ultimately, that her status in the national security establishment and credibility with the Pentagon brass is essential. Money, of course, is high on the list for a credible presidential run, and Clinton has been raising lots of it. Hollywood, which appears to hate war only when Republicans are waging it, is forming the left flank in her PAC operations. Meanwhile, Israeli billionaire friend Haim Saban (yes, that Saban) told theWashington Post that he will spend “whatever it takes” to get her elected. So what does this all mean in a practical sense? First, if Saban and other hardliners get their way, Clinton will come down on Iran like a ton of bricks in the nuclear negotiations and light as a feather on Israel in respect to the Palestinians in the West Bank and Gaza, especially given her comments to Goldberg over the summer. Furthermore, if the dynamics in North Africa and the Middle East remain the same, electing Clinton could lead to an even greater military footprint overseas. The Armed Services, ever the wailing Cassandras, will likely get the appropriations they want with less commotion, a boon for the defense industry. More importantly, her support of the military allows her to project an image of leadership and toughness during the campaign, which Adams says is absolutely necessary for winning the White House. “What this does is protect her right flank, it makes it very hard for anyone in the general election to accuse her of being soft on national security,” said Adams.